Because I love cherry flavored anything! 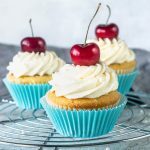 These Cherry Cupcakes have a Cherry Pastry Cream filling, and are topped with a White Chocolate Cream Cheese frosting. Every week I’ve been making cupcakes for #cupcakemondays on instagram. So far, I’ve made Strawberry Lemonade Cupcakes, Oreo Cupcakes, Macadamia Coconut Cupcakes, and Caramel Cashew Cupcakes. And wait til you see what I’ve got for next week! A friend of mine that I haven’t seen in years sent me a dm this week. He wanted to ask me a very “indiscreet” questions, he says. I said: Shoot! Love indiscreet questions! Well, first of all, friend, that question is not really indiscreet. Ask me how much I weigh because I bake so much, and there’s your indiscreet question. But “do you eat all of this that you make?” is probably the question I get the most since I started my blog Pies and Tacos. The answer is: OF COURSE NOT! I would be a planet if I did! That’s why I share my baking! Which is one of the reasons why I love baking in the first place! If you follow my posts, you’ll know it. I bake for others! These Cherry Cupcakes here, I didn’t even eat the one! I shared them all! I had some of the pastry cream filling and of course, I tasted the frosting! They were so delicious! And my friends who got to eat the cupcakes were delighted! I love baking more than I love eating, and that’s where I find my balance! I use baking as a form of communication, as a way to spread love. Consider me cliche for saying this, if you will. However, it’s truly what I feel in my heart! So, if you live around me, and you have a sweet tooth, come on over, come get some of these sweets off my hands! Request something, I’ll bake it for you! 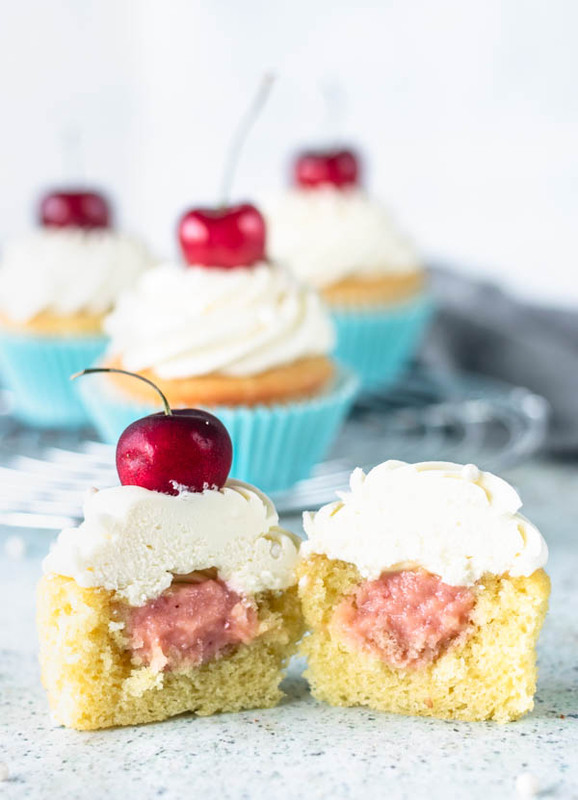 These are Cherry Cupcakes with Cherry Pastry Cream Filling, and White Chocolate Cream Cheese Frosting. Sift flour, baking powder, baking soda and salt together. Set aside. Whisk eggs with a wire whisk for about 1 minute. They will become frothy and lightened in color. Add oil and whisk until combined. Add sugar and whisk for about 1 minute. You can use a mixer to do this, or simply a whisk. I usually go with just a whisk. Add vanilla extract and half of the buttermilk. Whisk briefly until just combined. Now, add half of the dry ingredients and whisk gently until combined. Finally, add rest of the buttermilk. Whisk and then, add remaining flour. Make sure to just whisk the mixture until combined. Pour batter evenly into a cupcake pan lined with cupcake liners, or buttered and floured. Bake for 10-12 minutes, checking in between to rotate pans. Remove from the oven once cupcakes are lightly golden brown and puffed. Cook cherries, 2 tablespoons of granulated sugar and 2 tablespoons of water in a small saucepan over medium low heat for about 15 minutes, always stirring. Make sure to use the back of your spoon to mash the cherries as they cook. Remove from heat once cherries are falling apart and liquid looks thickened and darkened. Place contents of the cherry mixture in a small blender and puree until smooth. You should obtain about 1/4 cup of cherry puree, in case you don’t want to cook your own cherries and use some cherry pre-made jam instead. Whisk egg yolk and 1/4 cup sugar. Add cornstarch and whisk to combine. Bring milk to a boil in a small saucepan (you can use the same pan you used to cook the cherries). Slowly add one tablespoon of milk to sugar and yolk mixture., while whisking. Keep adding the milk little by little until it’s all combined. This is called tempering the egg. Once all milk is combined with the egg, add cherry puree to the mixture. Whisk to combine. Transfer mixture back to small saucepan. With a wooden spoon or spatula, start stirring the mixture over medium heat. Bring it to a boil. Let mixture cook for about 3 minutes, don’t stop stirring. Once custard is thick, remove it to a small bowl. Add vanilla and butter in. Stir to combine. Cover with a plastic wrap, placing the wrap directly on the surface of the pastry cream. Place in refrigerator until ready to use. Storage: Pastry Cream will last for about 3-4 days in the fridge. Melt white chocolate in the microwave at 30 second increments. Stir until completely melted. Set aside to cool. Before using chocolate, it should be almost completely cooled down, don’t use the chocolate when it’s still warm. Cream the cream cheese and butter together for about 1 minute on medium speed with your mixer. Add cooled white chocolate in. Beat to combine. With the mixer off, add all of the powdered sugar in. Mix on low until all the sugar is incorporated. Once that happens, raise speed to medium high and cream everything together for about 30 seconds. Add vanilla and cream for about 30 more seconds, until everything is incorporated and frosting is smooth. Storage: Frosting should be kept in the fridge for up to 1 week and in the freezer for up to 2 months. Cut a hole on top of the cupcakes with the help of a spoon. Hole should be about 1/2”. Add a little bit of cherry filling inside the cupcake. These are adorable! 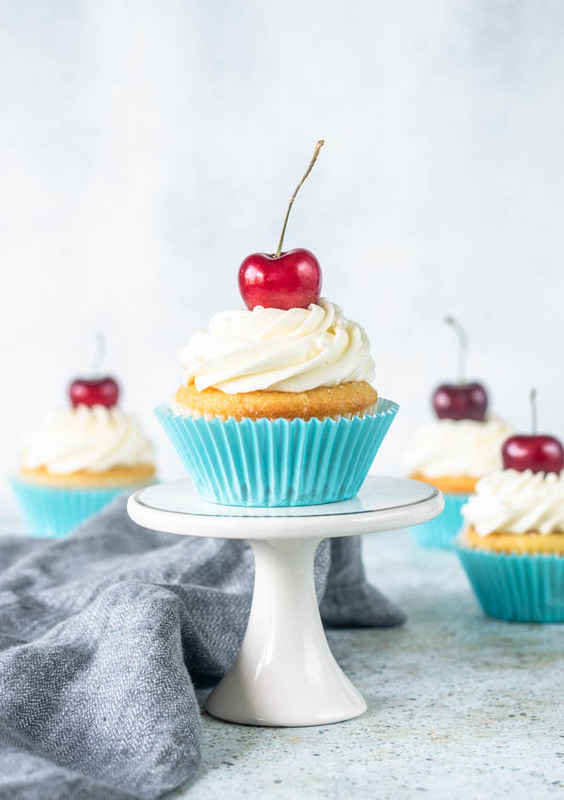 My husband loves cherries — definitely putting these on the list for his birthday! There is cupcakes and then there are cupcakes filled with cherry cream in the middle, yum!!!!! What beautiful little cupcakes. I am so excited for cherry season and all the delicious cherry desserts. Cherries are my top favorite summer fruit. Looks and sounds so delicious! Such beautiful cupcakes! These look so delicious! I love everything cherry flavored! 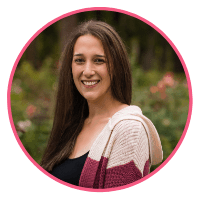 And I feel you, I couldn’t eat everything I bake (although I still eat a lot) and I love baking and cooking more than eating itself, but I don’t have that many to share it with me, so I need to restrain my baking – a little. 🙂 Your photos are stunning as always, Camila! Cherries, vanilla and white chocolate seems to me a perfect combination for my son’s birthday party which is coming next month. 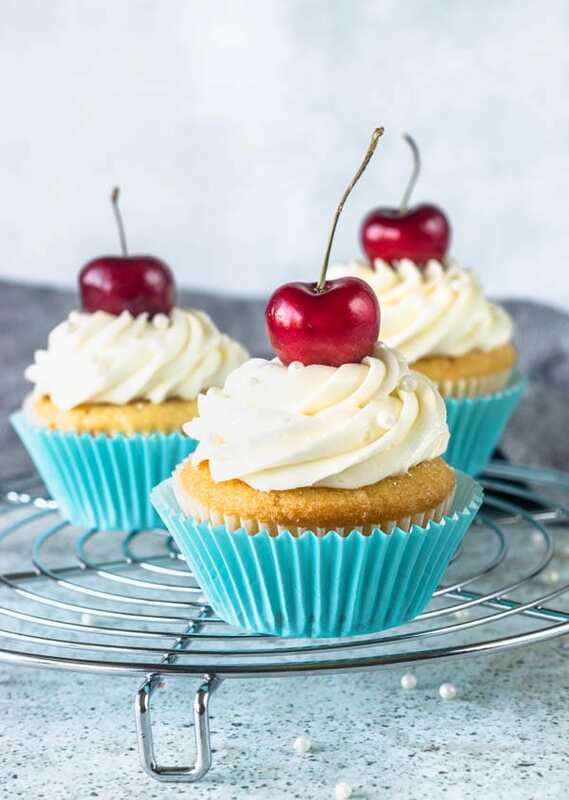 He loves cherries and your cupcakes look very presentable. These cupcakes are the most beautifully filled cupcakes I have ever seen! I love cherries, so this just sounds fantastic! And that white chocolate frosting sounds amazing! Thank you so much, Casey! The frosting was my favorite too!! 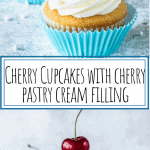 I love your idea of filling the cupcakes with cherry cream. And the cherry on the top just make the final touch, they look great! Yum! 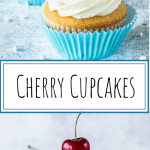 Cherry is such a cheerful summer flavor, these would be so cute at a summer cookout! We are soul-sister-bakers! I’m the same way haha! I USUALLY love the process of baking more than I love eating it. We give away most of the sweets that I make too but sometimes it’s difficult to part with them – lol!! Also, you are killing it with that flowy napkin business in the last shot!! This reminds me of my niece’s recent bday party. Her cake had a cherry filling. Omg, it was soo good! It looked just as good as your cupcakes. I really need to try your cupcakes out. I think cherry cake is my new favorite!